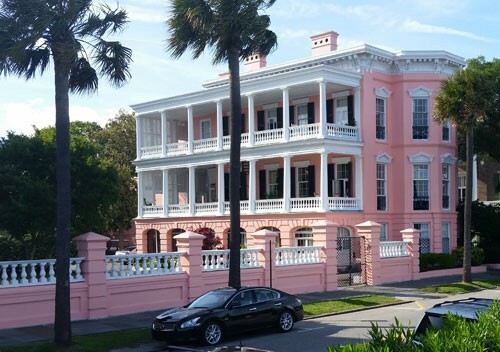 Charleston, South Carolina has been named the top city in America by Conde Nast for four years in a row, but my mother wants you to know she wanted to visit the city years before any of that happened. I’d like you to know that those ratings actually make a difference to the popularity of tourism in the city, which is why hotel room prices downtown have skyrocketed over the past few years. At least that’s what the nice man at the visitor center told us while he was booking our bus tour. I give the visitor center an A+. In addition to the regular flyers, maps and brochures you would expect, they have 3-4 people on staff who can help you book tours, hotel rooms and other touristy stuff. They also have a gift shop, so I was able to buy a magnet right away, which is something I do for every city I visit. I bought the magnet because it was pretty and the horse and carriage is on a spring, so it bounces around. 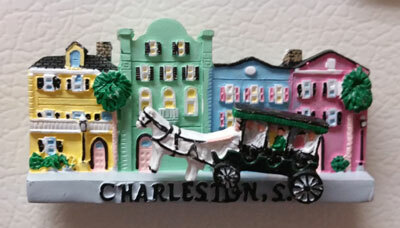 Later I learned the magnet is of Rainbow Row, a row of 13 houses in Charleston all painted a different color. My mom and I have been going on day trips in the area for a while now. First there was Biltmore, then Nag’s Head, then Wilmington and then Wilmington again. On the second Wilmington trip we popped down to Myrtle Beach for part of a day, but this time we made a South Carolina city our final destination and stayed in Charleston for two nights. We got booked on the last tour bus of the day with three other ladies. Our vehicle was an air-conditioned van, the kind that might shuttle you to a hotel and back. The company also had larger vans, but our tour guide wasn’t licensed to drive one of those. At the end of the tour he revealed it was the first time he’d both driven the bus and given the tour at the same time, which he’d done because he was filling in for someone who was sick. Despite those low expectations, the tour went rather well and we didn’t have any traffic accidents, though I did make sure to keep my seat belt buckled. I didn’t know much about Charleston, other than it was the home town of Stephen Colbert, who happened to announce he was funding every project South Carolina teachers currently had on DonorsChoose.org the very day we were visiting, which was a rather odd coincidence. I bet there were a lot of teachers kicking themselves for not posting a project on that site beforehand. There are a lot of beautiful things about Charleston. There are brightly colored houses, wide open porches, and a few houses with double winding staircases to the front door, which I learned was so men and women could enter a house on different sides so no man scandalously caught a glimpse of a women’s ankle on the way up. There are a lot more palm trees than I expected, and a lot more swamps too, though considering the fact that Frances “Swamp Fox” Marian is from this area, I probably shouldn’t have been surprised. This also made the “Swamp Fox” theme song stick in my head for half the bus tour. Did you know he was played by Leslie Nielsen? I had no idea. As lovely as Charleston is, the legacy of slavery can still be felt everywhere. 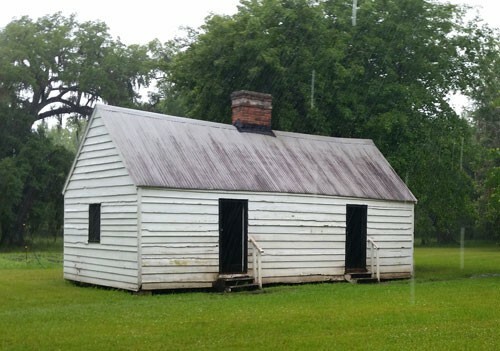 The tour guide pointed out the slave quarters at one estate, which were above the kitchen that was separated from the main house to prevent fires from spreading. I’m sure the forced residents of the kitchen house loved that idea. There is an area of town known as the Old Slave Mart which was shut down in the 1850’s when public slave auctions were outlawed and they had to move that stuff indoors. Our guide also pointed out a building with tall exterior walls that had been the designated fallback position if there were ever a slave revolt. This made me wonder if anyone who was making plans for the potential slave revolt ever thought to themselves, “Hey, if there is such a large danger of slaves revolting, maybe there is something inherently awful about slavery and we’re bad people for depending on it so much?” Then I kept hearing about how rich the residents had been. We passed at least two or three houses that were wedding gifts from rich fathers who had told their daughters to build the houses of their dreams. I guess with money like that they preferred to plan fallback positions instead of ending slavery. Anyway, considering how much the city depended on slavery, it shouldn’t be surprising that South Carolina was the first state to secede from the Union and that the first battle of the Civil War was fought at Fort Sumter, which is on an island off the Charleston coast. We made a stop halfway through the 90-minute bus tour at White Point Garden and got to stretch our legs. We could see Fort Sumter from there, but it was itty bitty in the distance. Pirates also used to raid in this area. Pirates! I was not expecting that. I associate pirates with the Caribbean and Johnny Depp, not South Carolina. After the bus tour we were pretty wiped out, so we crashed at the hotel until the next day when we visited Magnolia Plantation and Gardens. Do you know who else was visiting? Hurricane Ana. At least, she was on her way, which is why half our visit occurred in the rain. The peacocks didn’t seem to mind. Damn, peacocks must be able to jump pretty high to get on top of that sign. They can’t fly, right? 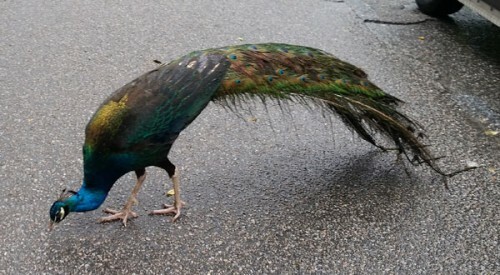 I know they attack with their talons, so if you ever get attacked by a peacock, look out for its feet! After watching a little film about the history of the plantation, we went on the train ride with two other visitors. I’m fairly certain our train driver thought we were all crazy and would have rather been somewhere dry and warm. But dammit, this was the day we had planned to see the plantation, so we were going to see the plantation! 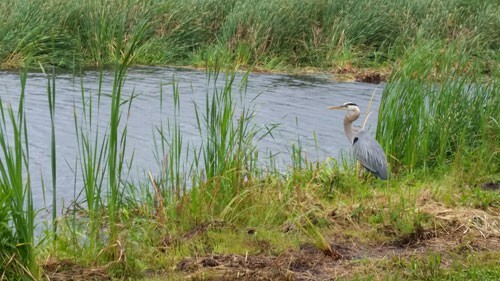 The local wildlife didn’t seem as bothered by the rain as the local humans. 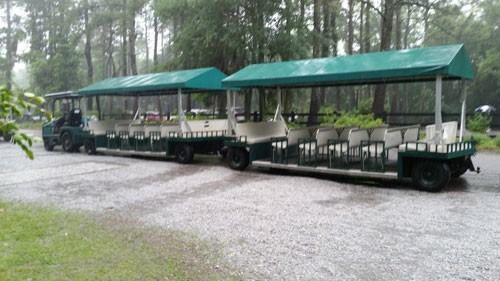 The tour took us by two different lakes, through a forest, and by the Ashley River. Oh, did I mention there were alligators? 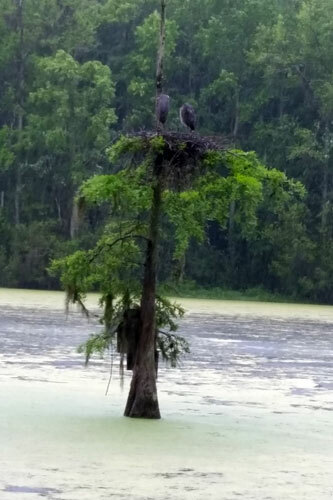 The rain had forced most of the gators into hiding, only surfacing enough of their bodies to breathe. Most of the gators on the grounds are small, but our guide said there were at least five large gators around. Thankfully we did not see any of them and that was perfectly all right with me. Our guide did point out two spots that are well-traveled gator trails from the lake to the river. I was glad there was no traffic on them at the moment! Oh, and of course there were old slave quarters. 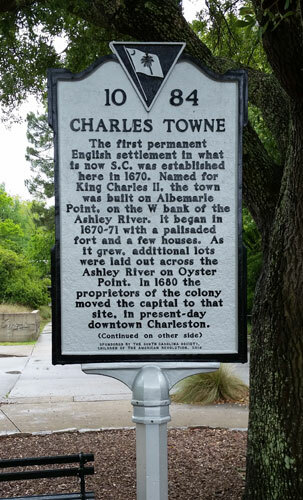 After that, my mom and I swung by the Charles Town Landing site which is the original marsh where they started Charleston until they moved the city to a better spot few years later. We looked around the visitor’s center, but didn’t feel up for walking around the park in the rain which is the only way to see it (unless you rent a bike, and biking in the rain didn’t sound any better), so we headed back to the hotel. Overall it was a nice visit to the “low country” which is what they kept calling the area in TV commercials and on the local news. However, I was happy to make our way back to the high country, even if we have less peacocks around here. 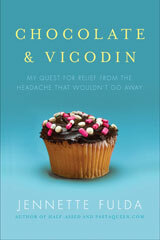 Really enjoyed this! Fascinating place. And … alligator! Eeep! I just added Charleston to my bucket list. I just read an article about the “money-empathy gap,” which proposed that the more money people have, the more they think about themselves rather than others. 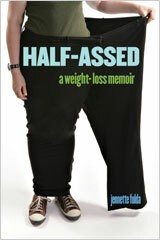 There have even been studies on the subject. So, yeh…rich. Comes from slaves? Oh, well. Also, I like reading about your travels with your mother. I am older than you, and many of my friends are facing losing their mothers to dementia or death. So I am glad that you are spending time together. You should visit Boone Plantation sometime. It’s an interesting tour and they also have women making seagrass baskets. You can watch and talk to them about the process. Also, don’t miss going to the Angel Tree. It’s awesome!